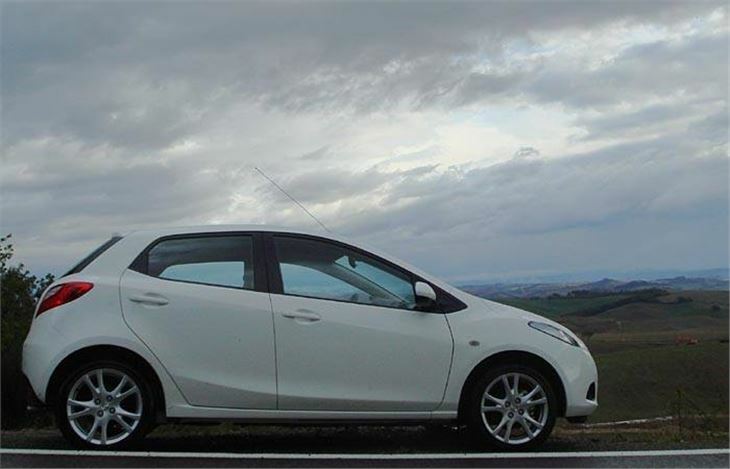 You’ve been able to buy the new Mazda 2 in the UK since 8th September, 2007. The launch was brought forward for 57 reg and because there was plenty of RHD production available from Japan. But LHD Europe won’t get it until November, so though the UK TV campaign started on 8th September, and though orders are coming in at twice the expected rate, most UK journalists weren’t able to drive the car until 3 weeks after the UK launch. I guess if we had, then orders might have been three times better (as they are in Japan) because we could have assured you it’s a smashing little car. It looks good from every angle. Comes in nice colours such as solid red, metallic green, gold, silver, metallic dark blue, metallic grey, and, happily, solid white. And it’s a hoot to drive. 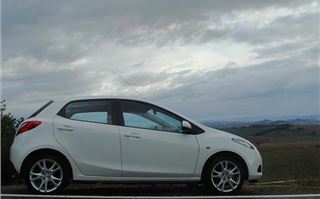 Mazda talks about “joy and love of ownership” and the Mazda 2 has so much sparkle, drivers, both men and women, are going to love it. 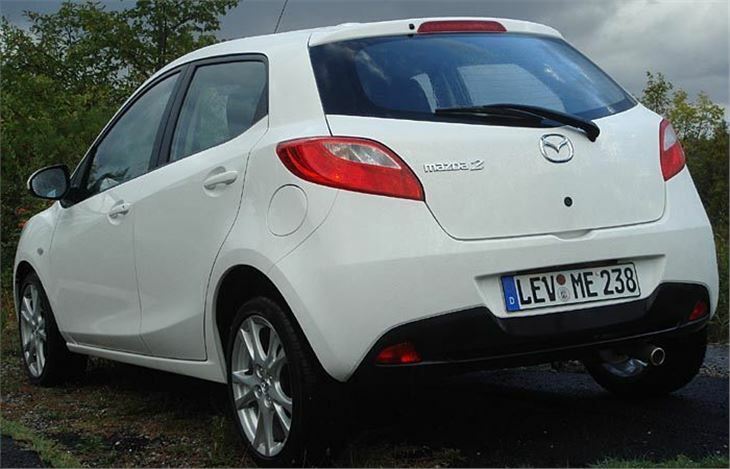 It’s lighter by 100kg than the old, boxy Mazda 2. It’s also a tiny bit shorter as well as lower and a lot stiffer. Without a driver inside it weighs only 955kg, bucking the trend among all cars these days to get bigger, fatter and heavier. That makes it more efficient. 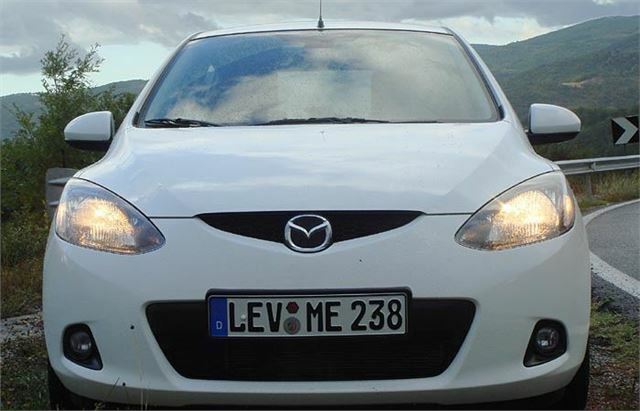 Both 1.3 engines will do 52.3mpg combined on the EC test cycle and emit just 129g/km CO2. Not quite low enough to get them into London tax-free from next February, but below what is likely to become a new EC wide tax band in years to come. And if you want to visit London in a Mazda 2 you can always do that in the forthcoming 1.4 diesel that put out a mere 114g/km CO2. Despite its small size it’s comfortable in the front and there’s plenty of head, leg and shoulder room in the back for three to sit across. 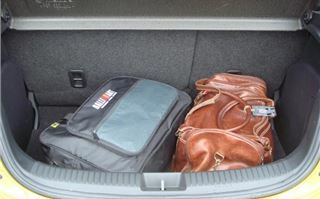 (More than in an Audi A6 or a Volvo S60, for example.) 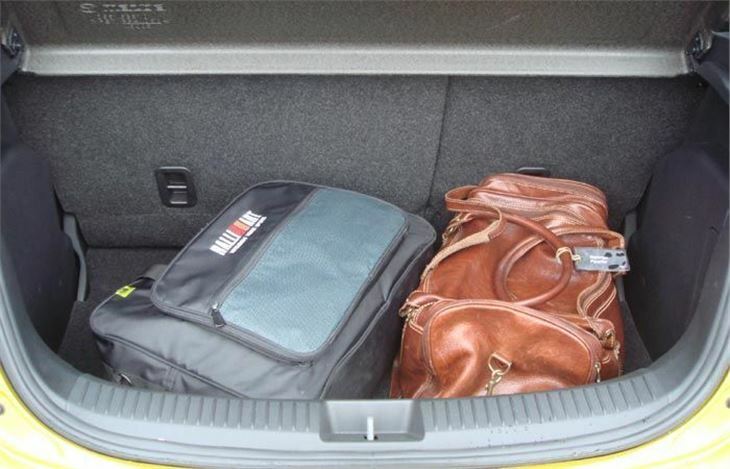 And the deep boot takes a reasonable 250 litres of luggage. 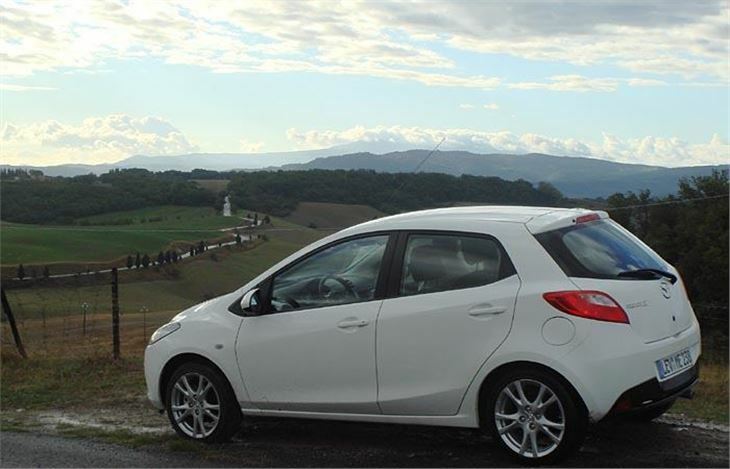 We drove the most basic 75hp 1.3 TS first and despite a bit of "stiction" in the steering on the motorway it proved a lively little handler on the wet and twisting roads of Tuscany. It’s quite high geared at 23.5mph per 1,000rpm in 5th, so feels a bit flat on the motorway. 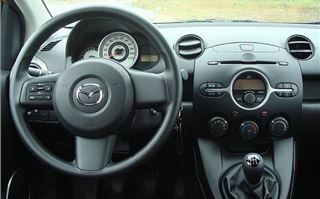 But 2nd is good for 60mph and 3rd for 87 so the gearing does make the most of its small power output. If £8,500 is all you want to spend and you can do without aircon, it’s a very nice little car for the money. In contrast, the 103hp 1.5 Sport is almost a hot hatch, in much the same way as the old shape Fiesta 1.6 Zetec S. It’s also lower geared at 22mph per 1,000rpm, so it’s noisier and very much perkier. I’d say, because of it’s more usable gear ratios, it’s at least as much fun as the more powerful but heavier MINI Cooper. And with standard features like Dynamic Stability Control and 16” alloy wheels with 195/45 R16 tyres you can enjoy yourself even on wet roads without getting into trouble. But the winner is the £9,995 86hp 1.3TS2. This not only revs very sweetly, it’s has the same slightly longer gears as the basic 1.3 TS and is quiet at speed, happily cruising at 80 - 90 completely fuss-free. Those extra 11hp are just enough to perk it up on country roads, and with alloy rather than steel 15” wheels it seemed to handle a touch more assuredly than the base car. Its amazing little engine was almost silent at its 600rpm idle and even pushing it hard on our test it still averaged 37mpg. Most drivers will probably get 45 – 55, which is excellent for a petrol engine. One small criticism was the lack of standard bump strips on the nicely sculpted doors, but these will be a dealer option. 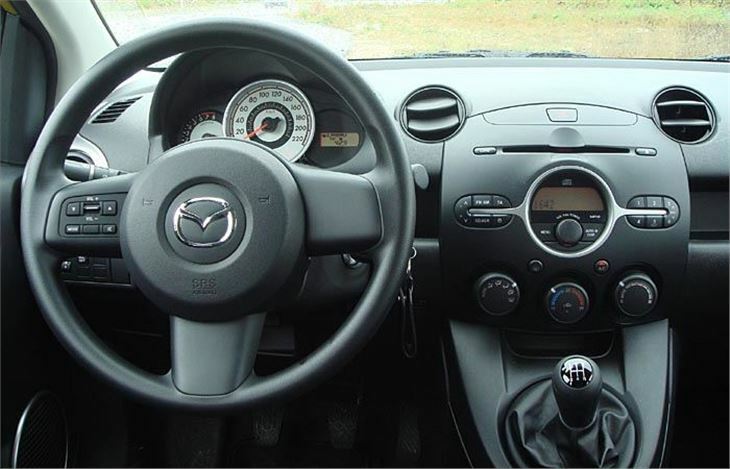 And in big bumps Mazda confidently expects a five star NCAP performance. 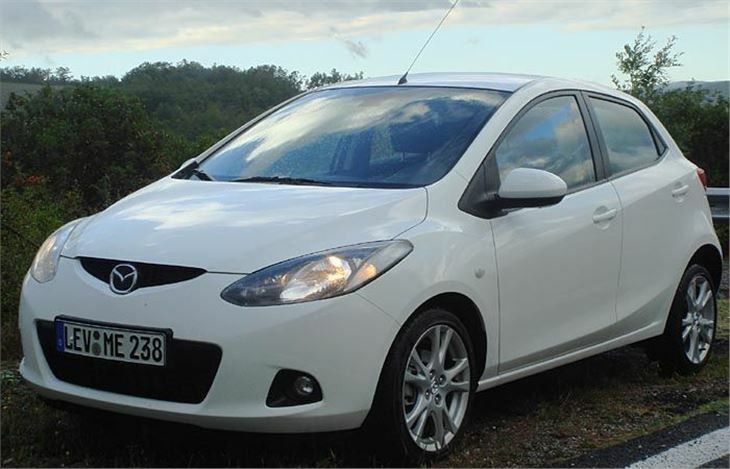 Overall, the Mazda 2 is sweet as a nut and goes straight to the top of the tree, over the Corsa and Clio, and even the 207 and Yaris. If you value fun over practicality it also beats the current Honda Jazz. Mazda thinks it will sell 12,000 in a full year. 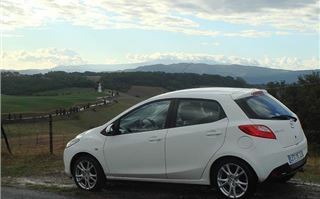 But if it can get the cars I think we’ll see a lot more Mazda 2s on UK roads.